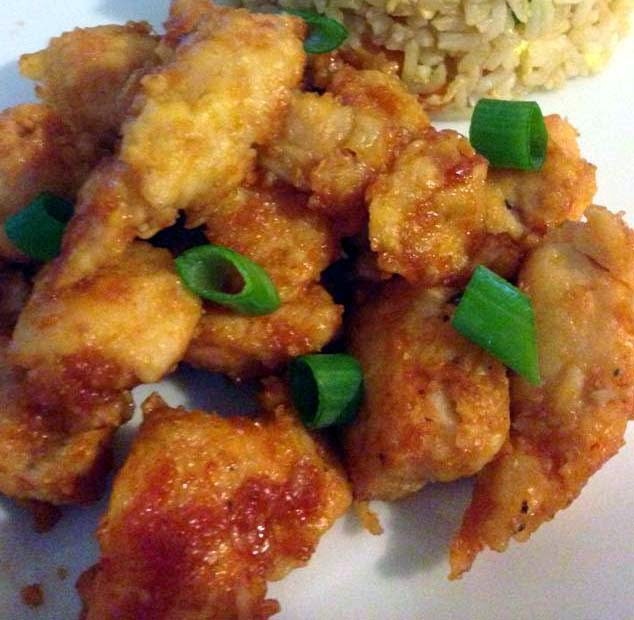 Sweet and sour chicken like those from Chinese restaurants can easily be made from your own kitchen using common ingredients. Here's one that I found from Food.com and made with some changes to make it healthier (hopefully). The differences have been noted below. In a bowl, mix dry ingredients (salt, pepper, cornstarch). Prepare chicken by covering each chunk with dry mix then coating with egg whites. The original recipe called for seasoning the chicken first before coating with cornstarch. I just mixed the dry ingredients altogether. Spray Pam onto a frying pan and brown chicken over medium-heat. Keep turning the chicken over so that it won't cook through. When done, arrange chicken chunks on a foil-lined baking dish. Make the sauce by wisking sugar, ketchup, vinegar, soy sauce and garlic powder in a bowl. Once done, pour sauce evenly onto the chicken chunks. Make sure that the chunks are coated evenly. Bake for 1 hour while turning chicken every 15 minutes. Let cool a little before serving. This goes well with fried rice.